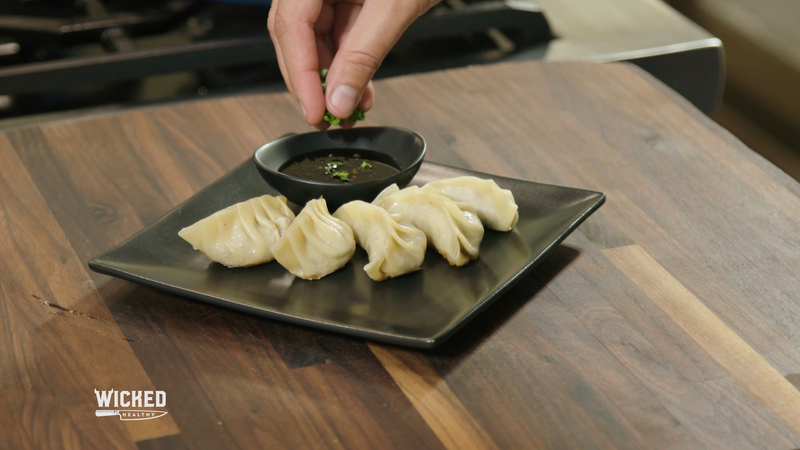 Making your own dumplings from scratch is fun and easy … we’ll show you how! These dumplings are stuffed with ground Field Roast Smoked Apple Sage Sausages, cabbage, onion and seasoned with sesame oil. We’re serving it up with a side of green onion black vinaigrette … check it out! Place the chopped sausage into a food process and pulse until finely ground. Preheat a cast iron pan over medium heat. Place half of the olive and sesame oils into the pan, then add the onion, cabbage and Thai chili. Add in the ground sausage and stir until well combined. Add in the remaining sesame oil, mirin, sea salt and green onions. Saute until softened, stirring occasionally. While it’s still warm, transfer the mixture to a medium-sized prep bowl and add in the cornstarch, stirring to coat. Allow the mixture to cool. Place a teaspoon of the mixture into the center of a dumpling skin. Dampen half of the edge with some water, then fold over, creating pleats along the edges. Transfer to a baking sheet that has been dusted with corn starch. Repeat with the rest of the mixture and dumpling skins. To sear and steam the dumplings, preheat a heavy cast iron pan over medium heat. Place the remaining olive oil into the pan. Working in batches, place the dumplings into a single layer, ensuring they do not touch each other. Look at the bottom of the dumpling, and when they are golden brown they are ready for the next step. Add about ¼ cup water to the pan to create a steaming effect, then cover and remove from heat. This process will allow the skins to cook for a few minutes. They are done when the bottoms are golden and the tops are soft. 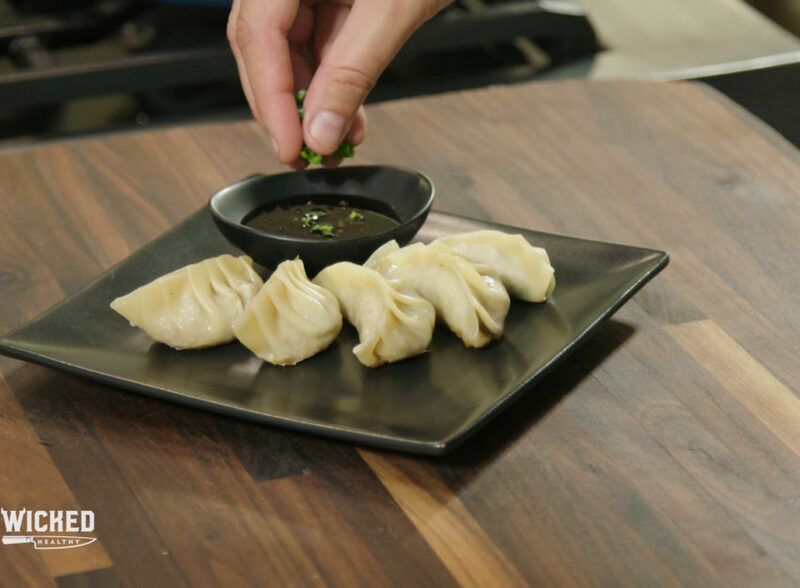 Transfer the dumplings to a plate and serve with a dumpling sauce of your choice.